BELLEFONTE, Pa. (AP) — A Penn State University fraternity pledge had toxic levels of alcohol in his body and was badly injured in a series of falls, authorities said Friday in announcing criminal charges for his death against 18 members of the organization and the fraternity itself. 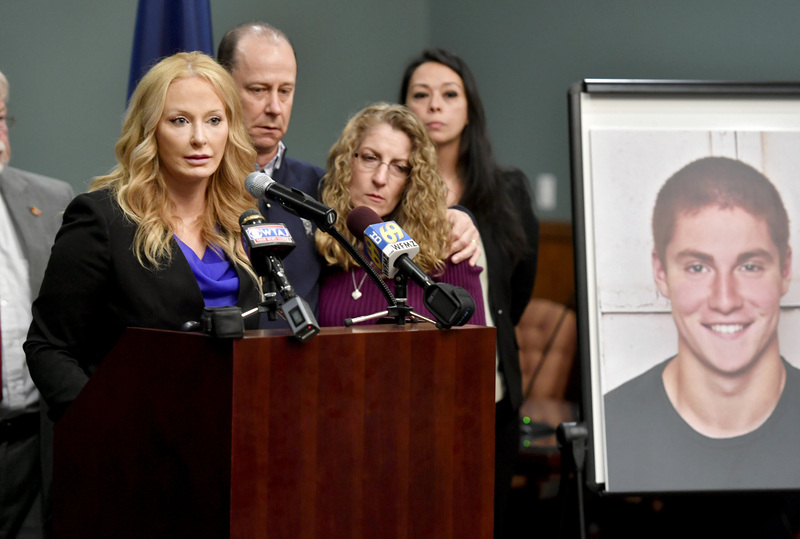 Centre County District Attorney Stacy Parks Miller said a grand jury investigation, greatly aided by security camera footage from the Beta Theta Pi chapter house, found that his friends failed to get help for 19-year-old Timothy Piazza before his death in February. The grand jury said their actions in some cases may have worsened his injuries. “This is a very sad day for Centre County — it’s been sad ever since we lost a child for reasons that are totally preventable. A child who just wanted to come to college here, who put his faith in Penn State,” Miller said in releasing a 65-page grand jury report and announcing charges. Eight of the fraternity brothers and the chapter itself were charged with involuntary manslaughter. Other charges include aggravated and simple assault, evidence tampering, alcohol-related violations and hazing. The grand jury said the fraternity was heavily stocked with booze for the Feb. 2 ceremony at which Piazza, a sophomore engineering student, and 13 others accepted pledge bids. The pledges were pressured to run a “gauntlet” of drinking stations that required them to chug vodka, shotgun beers and drink wine. Piazza fell down a long set of steps that night, and fell several other times, injuring his head, Miller said. The next morning he fell down the same steps a second time, and was unconscious when help was finally summoned. Piazza, from Lebanon, New Jersey, died Feb. 4 at Hershey Medical Center. Miller said doctors estimate Piazza had a blood-alcohol content of nearly .40 the night of the pledge ceremony, a dangerously high level. Penn State permanently banned Beta Theta Pi on March 30, accusing it of a “persistent pattern” of excessive drinking, drug use and hazing. University President Eric Barron planned to make a statement about the case later Friday. Miller said video footage turned over to investigators was critical to the investigation, providing evidence of what occurred and contradicting stories some witnesses had told. The cameras recorded Piazza drinking vodka and beer at around 9:20 p.m., and an hour later needing help to walk from an area near the basement stairs to a couch, staggering and hunched over. He’s later shown trying unsuccessfully to open the front door, then “severely staggering drunkenly toward the basement steps” at about 10:45 p.m., the grand jury report said. He was subsequently found at the bottom of the steps after apparently falling face-first. Four brothers carried his limp body back upstairs, where some poured liquid on him, and another slapped him in the face, the jury said. Fraternity members put a backpack containing textbooks on him so he would not suffocate on his own vomit, the jury wrote. When a brother insisted Piazza needed medical help, he was confronted and shoved into a wall, the report said. When the same brother insisted again that Piazza required help, he was told others were biology and kinesiology majors so his opinion wasn’t as valuable as theirs, the jury said. Piazza tried to get up around 3:20 a.m., but fell backward and hit his head on the wood floor, the report said. He fell onto a stone floor at 5 a.m. and was last caught on video after 7 a.m. He was discovered in the basement at about 10 a.m.
During the next 40 minutes, fraternity brothers shook him, tried to prop him up, covered him with a blanket, wiped his face and tried to dress him before one of them finally called 911, the jury said. The eight defendants facing more serious charges were scheduled to appear before a judge later Friday to be arraigned and have bail set. That will occur for the other defendants next week, Miller said. Five of them face only a single count each of evidence tampering.